Bluebells have soft leaves that are particularly sensitive to being trodden on. Once the leaves are damaged, they are unable to absorb the sunlight and die back. An awareness campaign is being launched at Worcester Woods Country Park to encourage visitors to do their bit to help protect the woodland and wildlife. 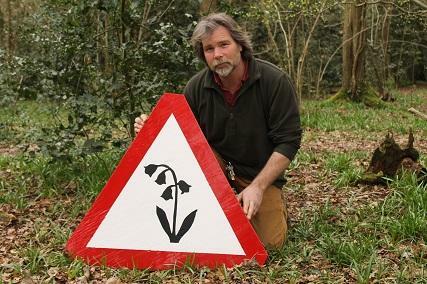 Park rangers will be installing special signs to remind people to stay on surfaced paths and not to trample on woodland flowers, including bluebells which are coming into flowering season. Worcester Woods Country Park Ranger Rob Stevenson said: "As the Country Park is now so popular we are running an awareness campaign with visitors to ask for their help to protect the woodland and wildlife. "I have made some 'road sign' style signs to make people aware of the damage they can inadvertently cause and to ask visitors to stay on surfaced paths. "The woodland at the park is ancient oak woodland and in the spring it has an amazing show of native bluebells, a feature unique to the UK. "We are asking visitors to stay on the main paths in the woodland as bluebells are very sensitive to trampling and by straying off the main paths, the high numbers of visitors the park now receives are inadvertently causing a lot of damage to this wonderful display." He added: "We are hoping that our campaign will raise awareness with the public and visitors to help preserve the wonderful woodland at the Country Park."